I read this article and found it very interesting, thought it might be something for you. The article is called India’s Wealth Is Rising. So Is Inequality and is located at https://archive.indiaspend.com/cover-story/indias-wealth-is-rising-so-is-inequality-96987. That is the observation by Oxfam India, an NGO that works on issues relating to poverty and development, in its latest report on inequality across the world. The situation is no different in India. 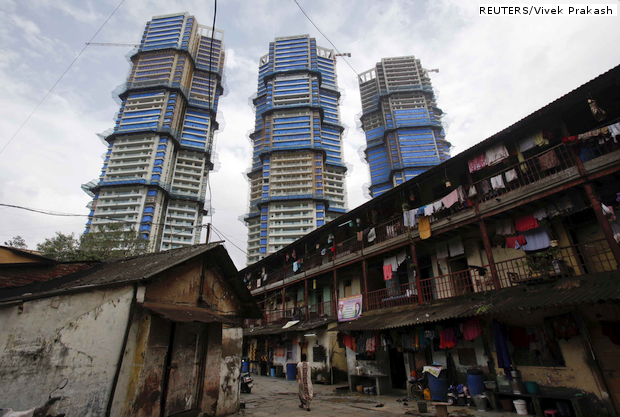 According to a study by the Asian Development Bank, the Gini coefficient (a widely-used measure of inequality; the higher the value, higher the income gap) has worsened in India between 1993 and 2009-10 going up from 33 to 37. Data on household consumption expenditure, collected by National Sample survey Office (NSSO) under the Ministry of Programme Implementation, could be used as a proxy to analyse income inequality. The table below shows the difference between rural and urban income from 2004-05 to 2011-12. India is becoming more unequal, not just between rural and urban areas but also within rural and urban areas. The income for the bottom decile (bottom 10% of the population) has increased from Rs 227.8 in 2004-05 to Rs 503.5 in 2011-12. During the same period, the income of the top decile (top 10% of the population) increased from Rs 1,478 to Rs 3,460. The story is similar in urban areas. Social protection is a cushion for those at the bottom against the effects of inequality. Social protection policies play an important role in reducing poverty and inequality and supporting inclusive growth by boosting human capital and productivity, supporting domestic demand and helping transform national economies. According to a report by the International Labour Organisation (ILO), only 27% of the global population enjoys access to comprehensive social security systems whereas 73% are covered only partially or not at all. India does badly on this count. The global average on social spending is 8.8% of GDP. Among BRICS nations, India spends the lowest proportion of public expenditure on social protection at 2.5%, while the highest is Brazil with 21.2%, as of 2010. China, more populous than India, spends 6.5% of total expenditure on social-protection schemes. Now let us look at the central and state-level spending on social protection in India. The good news is that spending on social protection schemes by centre and states has increased from 4.42% in 1995-96 to 5.25% in 2010-11. The figure records all social-protection spending as a percentage of GDP of both the centre and states. The Centre spends only 1.72% of its GDP on social protection and the states spend 3.5% of their GDP on social protection. Education takes the major share, followed by health and family welfare. Spending as a percentage of GDP on social security and welfare has increased from 0.25% in 1995-96 to 0.59% in 2010-11. This is due to the introduction of labour-related schemes, such as the Mahatma Gandhi National Rural Employment Guarantee Act (MGNREGA) and health insurance schemes like Rashtriya Swastha Bima Yojana (RSBY). Let us now look at the beneficiaries of social protection schemes in India. The old-age pension scheme benefits nearly one in four people above 60 years of age. The unemployed have a lot to worry, since only 3% receive benefits. Other schemes, such as social insurance and health coverage, totter along. The 12th Plan document has mentioned that social-protection spending needs to increase to 4.37% of the centre’s GDP annually to increase the coverage of these schemes. UNESCO, meanwhile, has suggested that the government widen and deepen the tax base, review tax rates and exemptions, and ensure better tax administration and tax compliance to fund social protection programmes. With inequality rising, the government might need to spend more on social-protection programmes, but with limited resources and a rising fiscal deficit, this will not be easy. The first graph in the article charts monthly per capita expenditure (MPCE) over the years but the graph is titled “Income in Urban and Rural Areas, Top and Bottom Deciles (Rs)”. Seems a little odd to me, that’s all. Wanted to confirm the authenticity of the figures mentioned in this video.